We’ve had our eye on the plans for the closed “gentlemens lounge” far west on 47th St for some time now, and this week DNAinfo discovered the full plans, including the name. 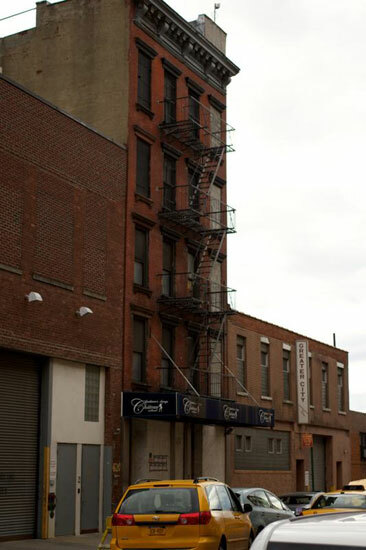 The new venue will be known as “Esquire NYC Gentleman’s Club”, and is going to full five entire floors. The initial plans were classing the establishment as a restaurant, which we naïvely believed. The club is planning to be “very upscale”, and apparently won’t have lineups, nor will it advertise with flyers, which should come as great news to anyone who’s had to dodge one of the guys handing out flyers along 8th Ave for the various clubs over there. The lot is at 41st & 10th, sitting next door to St Raphael’s Church, who developer Extell bought the rights for the development from last year for almost $16½ million (no big deal). Curbed covered the plans back in January. For future reference, here’s the site now. Try to imagine a wall of glass. The plans have work scheduled to complete in June 2016, so don’t hold your breath. Update: Curbed linked us! Thanks guys. Also, the site photo was linked to the wrong photo. Apologies, it’s fixed now. It’s been a big few weeks for the “Jungle” family of restaurants. Lime Jungle’s sister store Limón Jungle has also started fairly major renovations recently, which we covered last month. The place sold for over $600,000 less at the end of last year, so not bad for half a year of nothingness. We can dream. They’ve also taken their website down in the last 48 hours, so you know it’s official. We reached out to them when we saw they were closed, but never heard back, so the closure is still a mystery. The building is way out on W 47th St, almost right next to the West Side Highway, but things are starting to pick up with all the new hotels and developments popping up all over the place (Gotham West anyone? ), so it’s in with the restaurants and out with the “gentlemen’s lounges”. Somewhat of a minor local landmark, the iconic H&H Bagels signage opposite the Intrepid has towered over the West Side Highway for years, even after the company’s eviction at the start of last year. Back in June, we covered a new gay bar coming soon to 9th Ave. The bar is taking over the location previously occupied by Vintage, which has been closed since April. Now that construction is fully ramping up, we should be seeing a lot of progress in the coming weeks. The hotel isn’t scheduled to be opened mid-​2015. Don’t hold your breath! The spot is almost next door to the Broadway Comedy Club, so it’s easy to imagine a decent amount of dinner-​and-​a-​show customers coming through. Their application to take over the license from Swizz was discussed at the CB4 meeting on Tuesday, so depending on how that went, we can expect to see them moving in soon. One of the neighborhood’s few affordable grocery stores is hoping to get a discount on rent at a huge space across from the Port Authority Bus Terminal. Locals say the space at 551 Ninth Ave. — the former home of Project FIND’s Coffee House — would be a perfect spot for the Big Apple Meat Market. The community board gave its support to the move at its meeting on Wednesday, so the ball is in the Port Authority’s court. → Kashmir Dollar Burger closed for good?